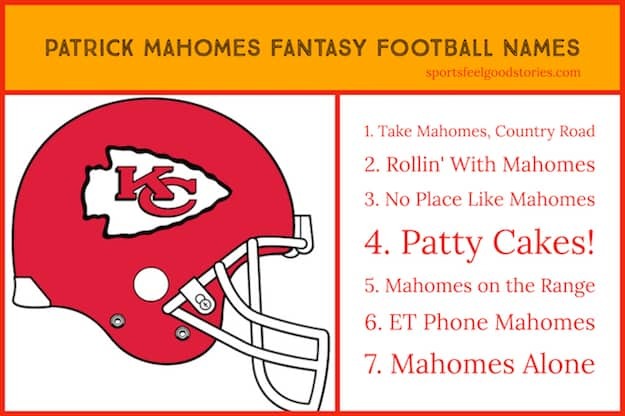 The Patrick Mahomes Fantasy Football Team Names page was long overdue. Taking the NFL and the fantasy football world by storm, Patrick Mahomes has started the 2018 with a bang! Through three career games as a starter, he has thrown 13 touchdown passes – setting an NFL record. Patrick Mahomes is the son of Pat and Randi Mahomes. Pat Mahomes is a former Major League Baseball pitcher who played for the Minnesota Twins. Playing baseball for Whitehouse High School in Texas, Mahomes pitched a no-hitter with 16 strikeout. Mahomes threw for 6 touchdown passes against the Pittsburgh Steelers in his second career start. He was the youngest player at 22 years of age to accomplish this feat. In 2018, he broke the NFL record for most TD passes thrown in the first two weeks of the season. Lights are on but no one’s Mahomes. Mahomes played college football for the Texas Tech Raiders. He accounted for over 12,000 yards of total offense in three years. He had a total of 115 touchdowns. His nickname with the Raiders was “The Musician” because of the way he played – very smooth. His style of play was frequently compared to Aaron Rodgers. He was selected number 10 in the draft by the Kansas City Chiefs. In his rookie season, he learned from starter Alex Smith, but did see some action. The Chiefs finished 10 & 6. In January, the Chiefs traded Smith to the Washington Redskins and named Mahomes as their starter. Check out Mahomes’ profile on the Chiefs’ site. Mahomes is where the heart is. You’re on Patrick Mahomes Fantasy Football Team Names page.